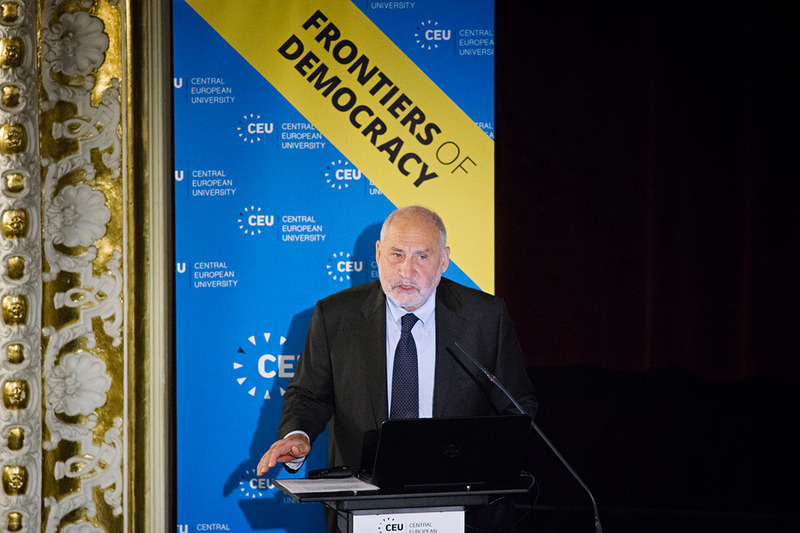 The conscious development of a learning society, essential for shared prosperity, can only be achieved in a liberal democracy, according to Nobel prize-winning economist Joseph Stiglitz, who spoke at CEU on Nov. 10 as part of CEU’s Frontiers of Democracy initiative. 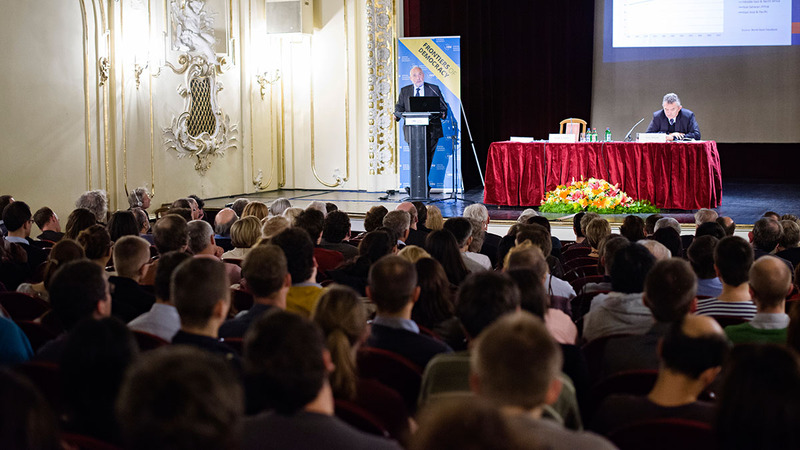 “A learning society mindset can only be sustained within a liberal democracy,” Stiglitz said, speaking to a full house as well as to hundreds of viewers watching a livestream of the lecture at venues such as Corvinus University, Eotvos Lorand University, University of Szeged, University of Debrecen, and three institutions in Slovakia as well as Columbia University, Stiglitz’s home institution. The lecture was hosted by CEU President and Rector John Shattuck and moderated by Professor Julius Horvath, head of CEU’s Department of Economics. Nobel laureate Professor Joseph Stiglitz speaks to a full house. Photo: CEU/Daniel Vegel. The transformation to a learning society was the primary reason for the enormous increase in standards of living of the past two centuries, Stiglitz said. While the Enlightenment achieved that transformation, in today’s world, economic policy and politics must work together to eliminate the income gaps that have arisen and create more equitable societies. There are practical, tangible reasons to strive toward a more equitable distribution of income, he said. Nobel laureate Professor Joseph Stiglitz speaks at CEU. Photo: CEU/Daniel Vegel. The vicious circle is perpetuated by insufficient checks on corruption, and failure of the rule of law, Stiglitz added. Stiglitz outlines this theory in his book “The Price of Inequality,” and proposes that policies support the development of a learning society in his most recent book, “Creating a Learning Society: A New Approach to Growth, Development, and Social Progress,” with Bruce Greenwald. Since markets on their own will not create shared prosperity, government policies must help it do so by encouraging the sharing of knowledge, of innovation, of science. Promoting the sharing of knowledge and lifelong learning often conflict with other economic goals such as encouraging efficient allocation of resources. 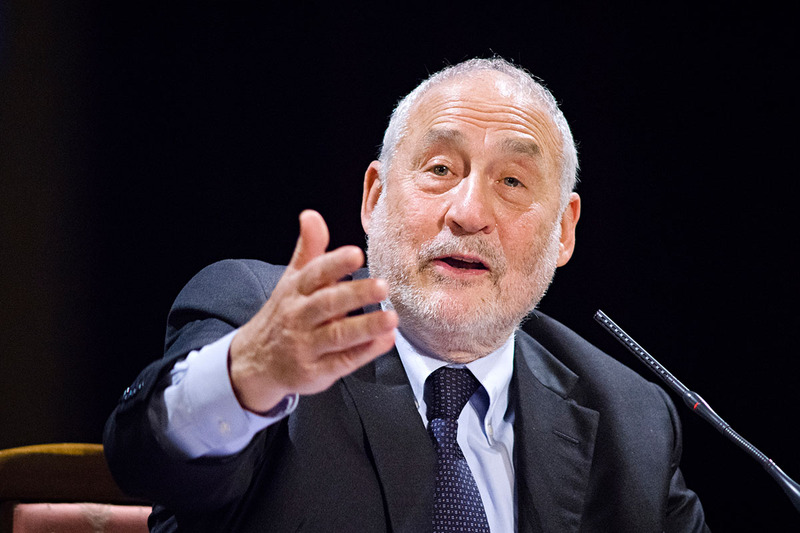 Industrial policies must address the former more than the latter, Stiglitz said. Intellectual property law, meanwhile, must be careful to reward innovation and thereby encourage it, but at the same time ensure that innovation occurs for the greater good in addition to, or rather than, private profit. He pointed to the 2013 U.S. Supreme Court case Association for Molecular Pathology v. Myriad Genetics, in which the court ruled that Myriad cannot patent isolated genes, after the company used its patents to restrict access (via high prices) to screening for genes showing a propensity for certain cancers. Stiglitz went on to advocate industrial policies that promote efforts to find new sources of energy, for example. China’s subsidies on solar panel production, which encountered much criticism in the U.S., achieve a social and environmental goal that may justify them, he said. and both industries are a result of industrial policies,” Stiglitz said. The European Union and the euro countries, in efforts to create a currency area that enjoys equitable income distribution, have made major mistakes by neglecting to introduce industrial policies, Stiglitz said. The connection between industrial policies and creation of a learning society is evident in the example of Korea, Stiglitz said. Forty years ago, when Korea was primarily a rice producer, the International Monetary Fund and World Bank recommend the country specialize in rice production. Korea chose to pursue industrialization, and soon surpassed the U.S. in efficiency of steel production, raising its standard of living in the process. In response to questions from the audience, Stiglitz advocated less restrictive copyrights on musical compositions and written works in order to stimulate the spread of knowledge and innovation, indicating that copyrights extending 70 years beyond the author’s death were excesses introduced by corporate lobbyists. He also advocated the promotion of research and open access at universities, since access to research is key to the creation of new knowledge. For more information on the Frontiers of Democracy initiative and future events in the series, see http://www.ceu.hu/category/frontiers-democracy.